Old Hoss Radbourn, winner of 59 games in 1884. 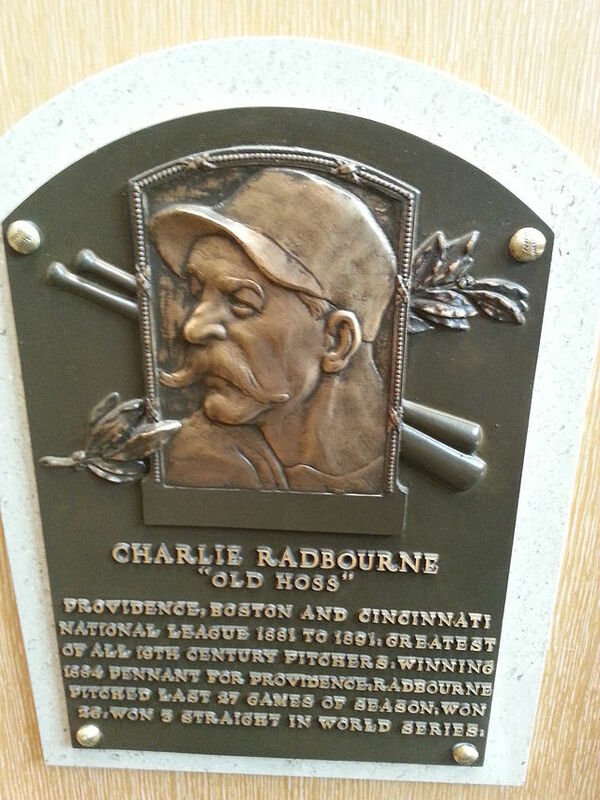 Radbourn is shown in profile. His bushy mustache twirls onto his cheeks; his heavy eyebrows provide a dramatic complement. He is not merely glancing at something; he is glaring. At what? The batter offering him a challenge from 50 feet away? Or a posse galloping forward on the desert floor? Radbourn has on a baseball cap, but he might as well be wearing a cowboy hat. He looks like the new sheriff in town. The records say that the right-hander was born in New York on this date in 1854 and raised in Illinois. But, he appears neither gentile enough to hail from the east coast, nor unassuming enough to call the Midwest home. He looks like a man more familiar with the cactus-riddled town of Yuma, Ariz., or the snow-packed village of Durango, Colo. In truth, little Charles Gardner Radbourn, the son of English immigrants, left with his family at age 1 from Rochester in upstate New York. The Radbourns settled in Bloomington, less than 40 miles from Peoria, in America’s heartland. Occasionally, a tall, slender lawyer from nearby Springfield made his way into town–Abraham Lincoln was looking for business. Old Hoss made himself into one of the greatest pitchers of all-time. His name, as you might expect by now, is one that goes back to the early days of baseball. He put together his best season during the Chester A. Arthur administration. The Peoria Reds, a barnstorming club, signed Radbourn to play baseball in 1878 as a right-fielder and a “change” pitcher. Teams could not substitute in those days. If the starter got tired, or if the other team began ripping line drives all over the field, a change pitcher—usually the right fielder–would exchange spots with him. This was still the era of underhand pitching in baseball and years away from a mound 60 feet, six inches from home plate. Radbourn threw rising fastballs, slow curveballs, screwballs and sinkers. He came at batters from all sorts of angles and arm speeds. Deception made him tough to pick up. Rad was something of the Luis Tiant of his day. He also had great control and a stubborn competitiveness. The 5-foot-9 Radbourn made it to the Majors in 1881 as a second baseman, right fielder and change pitcher for the Buffalo Bisons of the National League. He certainly didn’t look like a future Hall of Famer, not that he had much of a chance to prove himself. In six games as a rookie, he batted a puny .143 and didn’t throw an inning from the mound. Nevertheless, probably while practicing so much, he hurt his shoulder. The Bisons, probably without regret, released Radbourn. Fortunately, someone with the Providence Greys saw something in the young player. Just a couple of years later, in 1884, Old Hoss posted one of the greatest seasons in baseball history. He went 59-12, had a 1.38 ERA and struck out 441 batters in 678.2 innings. Let me repeat that last part: 678.2 innings. (Last season, David Price, splitting his time between the Tampa Rays and the Detroit Tigers, led the majors with 248.1 innings pitched.) Old Hoss Radbourn put up a 19.1 WAR. Of the 75 games he appeared in that incredible season, Radbourn started 73 and completed every one. Providence needed its ace to hold off the competition during the pennant race. Old Hoss, competitive as always, was game for a challenge. He started 41 of the team’s final 51 games, going 35-4-1. He won 14 games in August alone. And, yes, Providence did win its only pennant ever that season. Let us now acknowledge that Radbourn was not immune to this inhuman workload. He supposedly could not lift his arm high enough to brush his teeth following some starts. As for his hair, well, he did wear a cap. Brushing his locks was out of the question at times. And for all this, Providence paid Old Hoss $5,000, actually a nice sum in those days. The following season, Radbourn went 28-21 for Providence. He left for the Boston Beaneaters in 1886 and retired following the 1891 season as a member of the Cincinnati Reds. All told, Radbourn only pitched for 11 big league seasons, but he still won 309 games and ranks 19th in baseball history in that category. Retiring to his hometown of Bloomington, Radbourn opened a billard parlor and saloon. Unfortunately, he lost an eye in a hunting accident and spent most of the time in the back room of the saloon, away from the public. Radbourn, born more than six years before the first shot was fired in the Civil War, died Feb. 5, 1897, at age 42 after suffering from syphilis for several years. He was buried at Evergreen Memorial Cemetery in Bloomington. Maybe that Hall of Fame portrait didn’t tell the whole story. Old Hoss could crack a smile. No pitcher has won 40 games in a season since Ed Walsh did it in 1908. There was a time when pitchers didn’t think much about winning 40 games in one season. That time was the Gilded Age. Between 1877 and 1908, big-league pitchers won at least 40 games in one season 37 times. A few pitchers, such as Charles “Old Hoss” Radbourn, James “Pud” Galvin and Will White, did it more than once. Radbourn set the single-season mark with 59 wins for the Providence Greys in 1884. 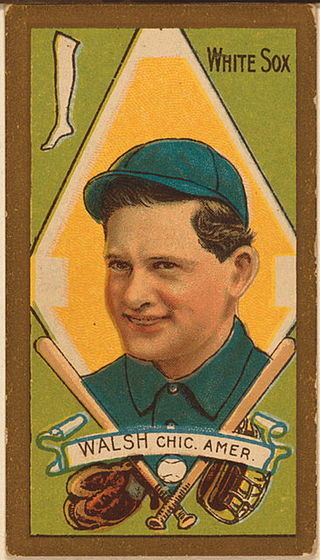 No pitcher has hit the 40-win mark since Ed Walsh compiled a sterling 40-15 record for the 1908 White Sox. The Tigers’ Denny McLain was the last pitcher to win at least 30 games in one season. He went 31-6 in 1968. (Who are the biggest single-season winners in baseball since 1968?) The last National League pitcher to win 30 games was Dizzy Dean, for the 1934 Cardinals.